Your beautiful home and routine vacuum experience depend on functional wall plates. Don’t let a broken vacuum inlet ruin the day. We offer a variety of types, colors, and styles ready for your wall today! 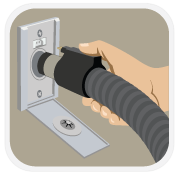 It’s an innovative auxiliary hose for central vacuums that is always there when you need. WallyFlex’s design makes cleaning extremely easy and installation simple. The hose stretches to 14 feet and standard attachments fit directly on WallyFlex. NEW! Vacuum dust right out of your home from areas that are hard to reach.This 90-degree elbow easily allows you to clean fixtures, fans, cabinet tops, and more. Vacuuming dust keeps your home a whole lot fresher than traditional dusting.